In addition to the standard features on the Ambition, the most advanced Style comes with 18" alloy wheels, bi-xenon headlights with LED daytime running lights, dimming rear mirror, rear LED light, dual zone climate control air conditioning, 8" touch-screen Columbus satellite navigation system, 8 speakers, front parking sensors, 3-spoke sports steering wheel, leather appointed upholstery and 9 airbags as standard. Prefill Braking is a safety feature that anticipates your next step — literally. 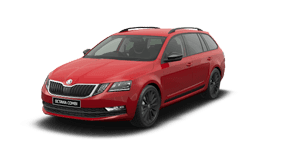 The OCTAVIA SPORT Wagon can recognise when you may be about to brake sharply and prepares by ‘prefilling’ the brake hydraulics with fluid. It also brings the brake pads closer to the discs, helping you stop safer, sooner. Some forward thinking for when you’re going backwards. A Rear View Camera, Front and Rear Parking Sensors◊, standard across the OCTAVIA range, help you back out of your driveway with peace of mind and tackle those tricky reverse parks with confidence. The OCTAVIA SPORT Wagon is packed with features for a rainy day. Light Assist automatically adapts to changing light conditions, while the rain sensor adjusts the speed of the wipers depending on light or heavy rainfall. We hope you never need the nine airbags that come standard in every OCTAVIA SPORT Wagon. They’re located at the front, front side, curtain, and driver's knee area. Overseas image shown. Just when you thought cruise control couldn’t get any smarter. Adaptive Cruise Control (ACC)◊ features a radar sensor on the front grille, allowing it to automatically brake and accelerate to a speed and distance set by you. It can also be individually varied by selecting one of the driving programs from the Driving Mode Selection. Did we mention it comes standard? As you get to know your OCTAVIA SPORT Wagon, it gets to know you, too. Driving Mode SelectionΔ adapts engine torque, accelerator sensitivity, power steering, headlight control (where AFS is fitted), DSG transmission, and air conditioning to your preferences, across four driving modes — Normal, Sport, Eco, and Individual. If you’re after trip information, the OCTAVIA SPORT Wagon puts it all on display. Enjoy a colour multifunctional display system that provides additional vehicle information including everything from oil temperature to phone, audio, Driver Assist Systems and navigation data. Black isn’t going out of fashion anytime soon thanks to the OCTAVIA SPORT Wagon. Enjoy black design elements including rear spoiler, mirror caps, fog lights and styling decals, plus a host of sport design features including 18” Turini black alloys and LED headlights with Adaptive Frontlight System. Right, let’s jump behind the wheel. Settle into the dynamic sports seat and get a feel for the three-spoke leather multifunctional super sport steering wheel.